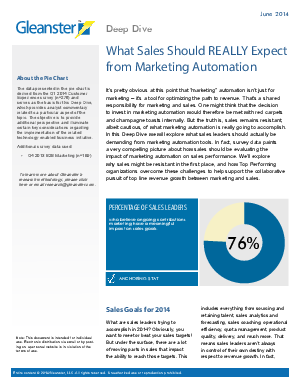 In this Deep Dive we will explore what sales leaders should actually be demanding from marketing automation tools. In fact, survey data paints a very compelling picture about how sales should be evaluating the impact of marketing automation on sales performance. We'll explore why sales might be resistant in the first place, and how Top Performing organizations overcome these challenges to help support the collaborative pursuit of top line revenue growth between marketing and sales.